For long years, the regional “war” between Saudi Arabia and Iran remained a matter of rhetoric, largely for internal consumption. The Arab Spring uprisings changed all that, by posing an existential threat to their reactionary regimes. As a result, Yemen has been utterly devastated by the sectarian proxy war these powers imposed on it following the overthrow of dictator Ali Abdullah Saleh in 2012. 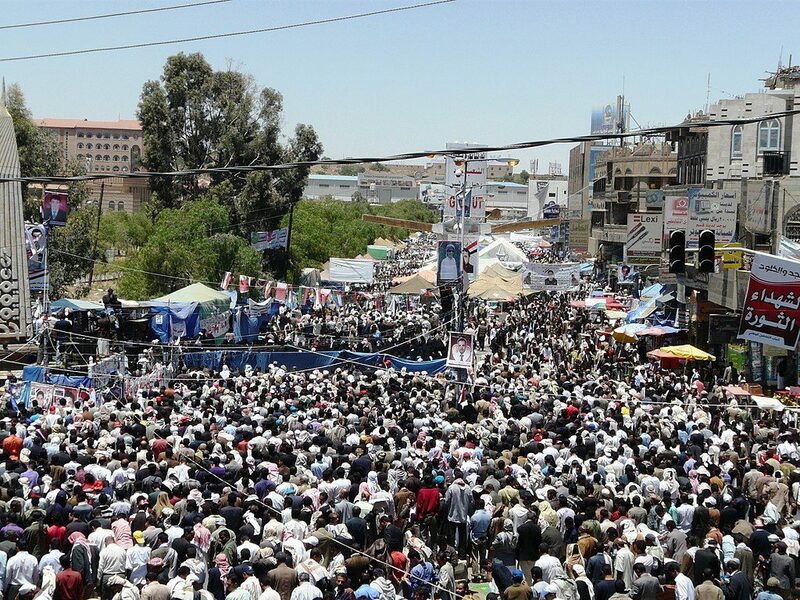 Protesters in Sana’a on 4 April 2011, during the early stages of the Yemeni Revolution. Photo: en.wikipedia.org. Many thousands have been killed—as in Syria, there is no accurate number because the UN stopped counting. Some observers estimate 50,000 dead. Thousands more have died of malnutrition and epidemic disease. The country’s health care system has collapsed. Up to 16 million people face hunger every day. Yemen’s civil society organizations, representing the revolutionary hopes of 2011, have presented humane terms for a peace agreement. The state powers and non-state actors dependent upon them have their own ideas, and this latter is what was negotiated between the Iran-supported Houthi rebels and the Saudi-supported Yemeni government in Sweden in December. The limited, but welcome, agreement included a withdrawal of forces from the Houthi-occupied port city of Hodeidah, entry point for most food and humanitarian aid; an exchange of prisoners; and a statement of understanding on the devastated city of Taiz. Despite the agreement, in recent days 16 Houthi troops have been killed in Taiz. The “withdrawal” from Hodeidah has consisted mainly of a change of uniforms. The Houthis have reneged on releasing prisoners—including women and civilian journalists. Local militias financed by the United Arab Emirates have continued to operate outside the framework of any central authority, sometimes incorporating or allying with elements of al-Qaeda. Most ominous, perhaps, was a Houthi drone strike on a Yemeni government military parade that killed its intelligence head. Drones have become a new factor in war, whether in the U.S.’s deadly high tech version or in the homemade reconnaissance drones used in Syria. Here we see a combination of these cheaper drones with the Improvised Explosive Devices used to deadly effect in Iraq and Afghanistan. This will not remain confined to Yemen. This entry was posted in Articles and tagged Afghanistan, al Qaeda, Ali Abdullah Saleh, Arab spring, drone strikes, Gerry Emmett, Hodeidah, Houthis, IEDs, Iran, Iraq, Saudi Arabia, Syria, Taiz, United Arab Emirates, World in View, Yemen. Bookmark the permalink.